I've said this many times... look how far the US has fallen since its revolution against the British monarchy. The US is engaged in a love fest with the head-choppin, money wasting, war-making monarchy in Saudi Arabia. 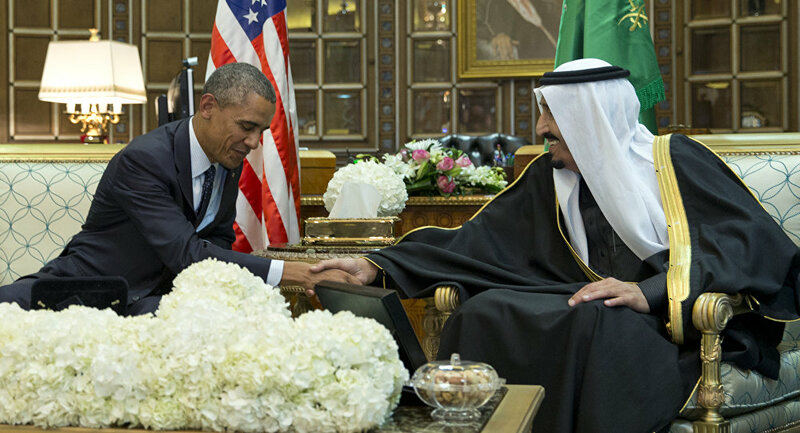 The Saudis make war on Yemen and Obama steps up and says, "Yes sir, what can we do to help!" The reality is that the real threats to the monarchy, domestic in nature and beyond Washington's reach, include the kingdom's general repression and particular mistreatment of its Shia minority. This was demonstrated the recent execution of cleric Nimr al-Nimr, who urged nonviolent opposition to the monarchy. In a statement released by the State Department last weekend US Secretary of State John Kerry had this to say about the Saudis: "We have as solid a relationship, as clear an alliance, and as strong a friendship with the Kingdom of Saudi Arabia as we ever had, and nothing has changed." Ultimately, Cato Institute Senior Fellow Doug Bandow writes, "whatever the alleged benefits of the Saudi alliance, America pays a high price." "First is the cost of providing free bodyguards for the royals. For this reason the United States initiated the first Gulf War and left a garrison on Saudi soil. The inconclusive end of that conflict led to continual bombing of Iraq even during 'peacetime' and ultimately the Iraq invasion. At the Saudis’ behest, Washington backs their misbegotten war in Yemen and remains formally committed to the overthrow of Syrian president Bashar al-Assad, the strongest force opposing the far more dangerous Islamic State." Democratic party presidential candidate Bernie Sanders has repeatedly called on the US to get Saudi Arabia to do more of the killing of ISIS throughout the Middle East. It is true that Saudi Arabia has not been engaged in the anti-ISIS coalition. But the reason primarily is that Saudi Arabia is a major funder of ISIS which has been the shock troops for the Gulf monarchies in their dirty effort to take down Syria and destabilize Iran. Does Bernie Sanders not know this? Seems unlikely to me.